All disease begins in the gut, said Hippocrates approximately 2,000 years ago. This very statement is why my practice has shifted from hormones to digestive wellness predominantly. Nearly all of my clients, no matter their primary health issue or goal, have symptoms of poor digestion. Some have nagging, low grade bloating or heartburn. Others have IBS and more serious chronic issues that, in turn, cause anxiety, depression, or insomnia. If you’re not digesting well because your internal ecosystem is off balance, you won’t be absorbing the nutrients from your food, leading to deficiencies, fatigue, hormone imbalance (yes, it’s all connected), weakened immunity, and even weight gain. Certain foods can soothe and tone the digestive tract. 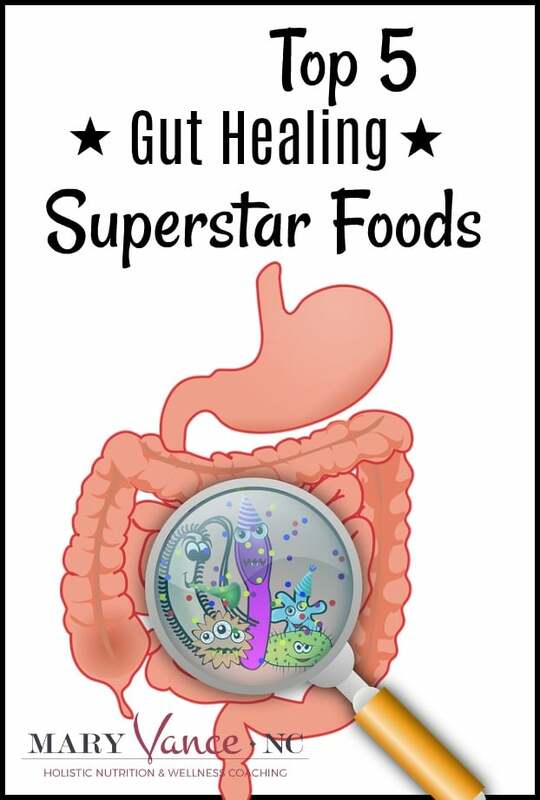 The foods I typically include as part of my gut healing programs are anti-inflammatory; they contain nutrients your body uses for intestinal repair; and they nourish your microbiome, the ecosystem in your large intestine that helps you digest food and produces vitamins that keep you healthy. Of course, not everyone can tolerate every recommended food because of histamine or FODMAP intolerance, for example, but most of these foods work wonders for any gut. And no, bone broth did not make my list! See why below. 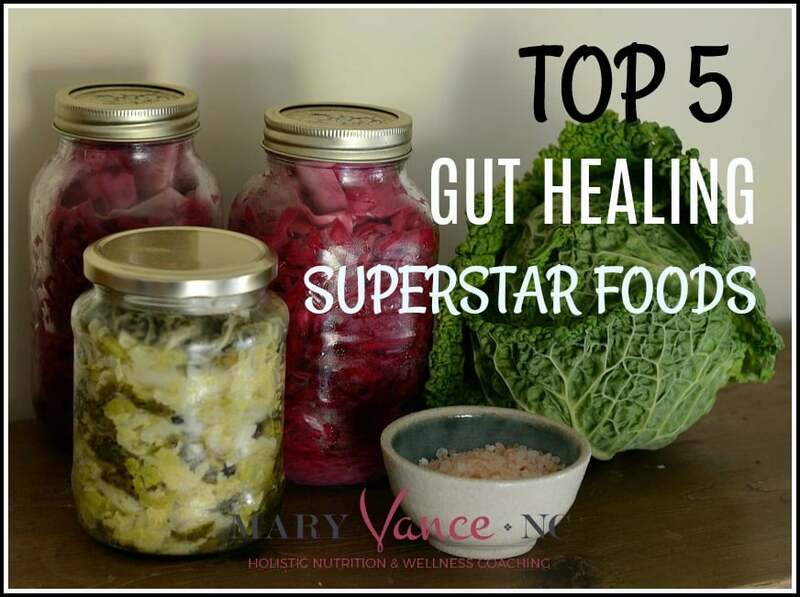 Ferments: fermented foods are your digestive foundational rockstars. These traditional foods are lactofermented with sugar or starch. That means lactobacillus bacteria which are present on plant surfaces turn the starches or sugars into lactic acid that preserves the food and gives it a sour flavor. Beneficial enzymes and probiotics are produced as a result of fermentation. When you eat or drink the ferments, you’re introducing lots of different strains of beneficial bacteria into your digestive tract. These workhorse probiotics help you digest food and boost your immune system. My favorite ferments include cultured vegetables like raw kraut (I like Farmhouse Cultures because I’m too lazy to make my own); coconut water kefir; miso paste; pickles; kimchi; and beet kvass. Kombucha is fine too, though not everyone tolerates it. If you’re OK with dairy, kefir or goat kefir has more probiotics than regular yogurt. I also love coconut milk yogurt. Side note: lactofermented watermelon rind pickles are an excellent source of the amino acid citruline, which helps dilate blood vessels and improve circulation. So don’t toss out the rind next time you’re eating watermelon. Ferment it! HOW TO EAT FERMENTS: introduce fermented foods and/or beverages slowly. Start with just 1 tbsp of kraut or a serving of a fermented beverage (quantity depends on the beverage) per day. Increase from there, but it is possible to overdo it, so don’t go crazy. You might experience gas and bloating at first, which is somewhat normal, but if you have ongoing troublesome adverse reactions, it can indicate histamine intolerance or SIBO. And don’t throw out the kraut juice! Add it to soups, sauces, dressings, or take a shot of it. The liquid is very probiotic-rich. Beware that you don’t want to buy the overly processed pickles and sauerkraut you see on most chain grocery store shelves. They’ve often been heated and pasteurized, which kills the beneficial bacteria and halts any fermentation. They also contain preservatives and artificial colors. Real fermented foods are alive! Most store-bought name brand pickles and kraut are dead (no live probiotics or enzymes). NOTE: if you are histamine intolerant or if you have SIBO, you may not be able to tolerate fermented foods. You can try again in the future. 2. Resistant Starch is a type of prebiotic that is indigestible to us but provides food for our probiotic gut bacteria. That means you (your organs) cannot break down or absorb this starch in your stomach or small intestine, but some of the trillions of bacteria that live inside your gut love it. Fascinating, right? This is super important because our beneficial probiotics need to be fed, or they starve and die. And that’s bad news for your digestive health. Resistant starch is basically a superfood for your gut bacteria, keeping them happy, and they produce some amazing byproducts when they eat it, and that benefits you in myriad ways. It’s kind of like taking care of your own little internal garden! Resistant starch (RS) reaches your large intestine intact. In the large intestine and colon, your gut bacteria ferment the RS and produce short chain fatty acids (SCFA) as byproducts. This is great for you! SCFAs (especially butyrate) have a number of gut health benefits. Butyrate especially is the preferred energy source of the cells lining the colon, and it also plays a number of roles in increasing metabolism, decreasing inflammation, and improving stress resistance (source). Butter is another great source of butyrate. HOW TO ADD RESISTANT STARCH TO YOUR DIET: the easiest way to eat RS is green bananas (don’t laugh; I actually prefer green to ripe. They’re good in smoothies); cooked and cooled rice; and cooked and cooled potatoes. Start slowly and build up. Some of you won’t be able to tolerate RS off the bat if you’re working to heal SIBO or other gut imbalances. You can also try adding raw potato starch or banana flour to smoothies. Generally you want to aim for about 15 – 30 grams daily for active healing (meaning you’re trying to lose weight, stabilize blood sugar, or heal your gut). Start with 1/4 – 1/2 tsp in smoothies and work up from there. Other grains and legumes are sources of RS too, but not everyone will be able to tolerate those foods. See a full list here. This article is a great tutorial on RS with helpful ways to add it to your diet. 3. Anti-inflammatory foods should be the foundation of any gut healing program. If you have candida, parasites, dysbiosis (bad bacteria overgrowth) or leaky gut, your digestive tract is inflamed. If this inflammation goes unchecked, it eventually becomes systemic (source and source) causing impaired immunity and increasing your disease risk. If you have chronic joint pain, any “–itis” condition, elevated LDL cholesterol, high CRP, and chronically high or high-normal white blood cell counts, you have systemic inflammation. For gut healing in particular, I recommend blueberries, ginger, turmeric or curcumin, and omega 3 fatty acid-rich foods (wild salmon and sardines especially; plus you can supplement with fish oil) to quell inflammation. Almost everyone can tolerate these foods, and they have a powerful anti-inflammatory effect. Throw in some green tea for good measure. In fact, swap out your coffee, which is a gut irritant, for a mug of green tea or matcha in the mornings. HOW TO BEEF UP ON YOUR INFLAMMATORY FOODS: eat more wild salmon; snack on sardines; drink green tea; throw in some leafy greens too. Walnuts and chia are also good sources. Try my turmeric tonic. You can supplement with fish oil and curcumin. Turmeric alone won’t provide the anti-inflammatory punch that curcumin will, so I often tell people to supplement with curcumin for several weeks, then use turmeric to maintain benefits. Don’t forget the ginger; it’s related to turmeric (they look very similar) and offers potent anti-inflammatory and antioxidant properties. It’s awesome for relieving nausea and bloating. Safe for pregnancy. So mix up yourself some ginger tea by grating a good chunk of the root in a mug; let it steep 10 minutes; strain; drink. Here’s my full post on how to eat anti-inflammatory. You’ll see bone broth mentioned in gut healing everything because it is a good source of collagen, gelatin, and the amino acids your body uses for intestinal repair. But collagen peptides are more easily absorbed and offer more amino acids and gut healing benefit than the amount of bone broth alone you’d want to drink on any given day. Kind of like curcumin vs turmeric. Also, low FODMAP and histamine intolerant folks often can’t tolerate bone broth, and these are the peeps who need it most. So, go straight to the source and include collagen peptides as part of your daily protocol, and save the bone broth to use for soups and stews. HOW TO USE COLLAGEN PEPTIDES: add to your morning smoothie along with gut healing protein, blueberries, spirulina, and coconut milk, and you got yourself a gut healing power meal. You can also add it to tea or snacks like energy bites. 5. Soups & stews are like a nice hug for your gut. I almost always tell my leaky gut and SIBO clients to avoid raw foods which are harder for an inflamed gut to digest. Soups are wonderful for people to calm the gut during IBS or IBD flares. They’re easy to make and easy to customize. And yes, you can use bone broth as a base if you tolerate it. HOW TO ADD SOUPS & STEWS TO YOUR DIET: I have a gut healing soup recipe that includes easy to digest foods like shredded carrot, chicken, spinach, and ginger. Kind of like this (one of my most popular recipes). It excludes sweet potatoes and potatoes that many people with IBS and IBD have trouble digesting. You’d also need to avoid onion and garlic and swap out spinach for chard if you have SIBO. But really, the sky’s the limit when it comes to soup. Use bone broth for extra nutrients, and add whatever veggies and meat (if desired) you tolerate. Long, slowly simmered food is warming and easy to digest. You can also puree everything for a souper (sorry, I couldn’t resist) easy to digest option. And even better, you can make a large batch and have plenty for leftovers. BONUS: I mentioned that certain foods that have a tonifying effect on the gut, and triphala is one such example. It’s a combo of three herbs that are great for constipation and motility and tone the large intestine and colon. Read how to use it here. Hi Cory, for heavy metal toxicity you’d need to work with a practitioner to safely detox. There are certain supplements and foods to enhance the process, but it’s not safe to navigate it alone. Doe fermented food go bad? Autumn, they definitely have a point at which they lose freshness, but ferments don’t spoil like traditional foods. I try to use raw kraut within 6 months (usually I use it up within a few weeks). Would you recommend the above for chemo induced chronic diarrhea? Jamie, yes– any gut support during chemo (unless otherwise directed by your doctor) will help. The microbiome is the foundation of your immune system!